These findings come from demographic models built by Pew Research Center to show how Europe’s population is changing. It is impossible to predict future migration flows, so we modeled three different scenarios with varying levels of migration to project what could happen by the year 2050. Without any more migration, Germany’s aging population would be expected to decline about 15% by 2050. But if recent migration patterns continue, its overall population is projected to hold steady or even increase by the middle of the 21st century, in large part due to the arrival of Muslim immigrants. Between mid-2010 and mid-2016, Germany accepted an estimated 670,000 refugees, roughly 86% of whom are Muslims. In addition, 680,000 “regular” migrants from outside the EU (non-refugees who moved for economic, family or other reasons) have come to Germany between mid-2010 and mid-2016, although a smaller percentage of these migrants (40%) are Muslims. Altogether, Germany received a total of about 1.35 million migrants during this period – including an estimated 850,000 Muslims. This figure excludes an additional 540,000 asylum seekers whose applications for asylum have been rejected or are expected to be rejected, based on past approval rates. Similar patterns are expected in the future. 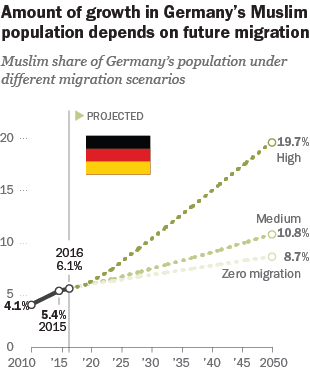 Even if all migration to and from Germany were to stop as of the middle of 2016, Germany’s Muslim population would be projected to increase by about 1 million, from just under 5 million (6.1% of the 2016 population) to 6 million in 2050 (8.7% of a shrinking overall population). This is because Muslims in Germany are considerably younger than non-Muslims – with median ages of 31 and 47, respectively, in 2016 – and because Muslim women have more children (1.9, on average) than non-Muslims in Germany (1.4). In a “medium” migration scenario – which envisions regular migration continuing, but all refugee flows coming to a stop as of mid-2016 – Muslims would number 8.5 million and make up 10.8% of Germany’s population in 2050. This is smaller than the projected Muslim populations in this scenario in the United Kingdom (13.1 million) and France (12.6 million), because the UK and France have tended to receive more regular Muslim migrants than Germany, while far more Muslim refugees have arrived in Germany. 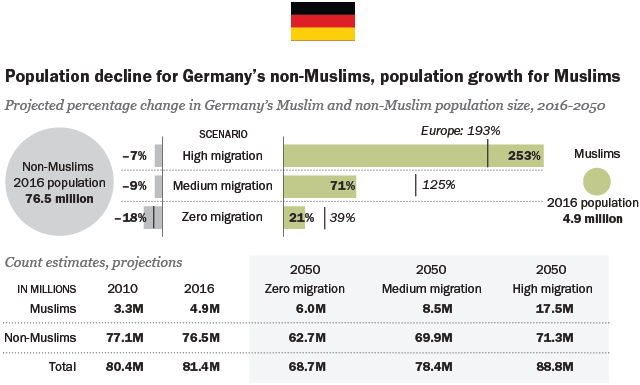 Alternatively, in a “high” migration scenario in which both regular migration and the heavy flows of refugees from the Middle East were to continue indefinitely into the future, Germany’s Muslim population would be expected to more than triple by 2050, growing from 4.9 million (6.0%) to 17.5 million (19.7%). In this scenario, Germany would have the largest Muslim population in Europe at midcentury. The high migration scenario perhaps best corresponds to the last year in Germany, because a large volume of applications for asylum continued to arrive after mid-2016 (the end of the time period analyzed in this report). However, recent policy shifts have made the high scenario less realistic in the future; an EU agreement with Turkey has slowed the influx of refugees to mainland Europe, and the German government has taken steps to limit future flows. After a September 2017 election gave the far-right Alternative for Germany party a presence in parliament for the first time, Merkel signaled openness to limiting the number of asylum seekers entering Germany to 200,000 per year. These conflicting factors may put Germany’s current course somewhere in between the medium and high scenarios. 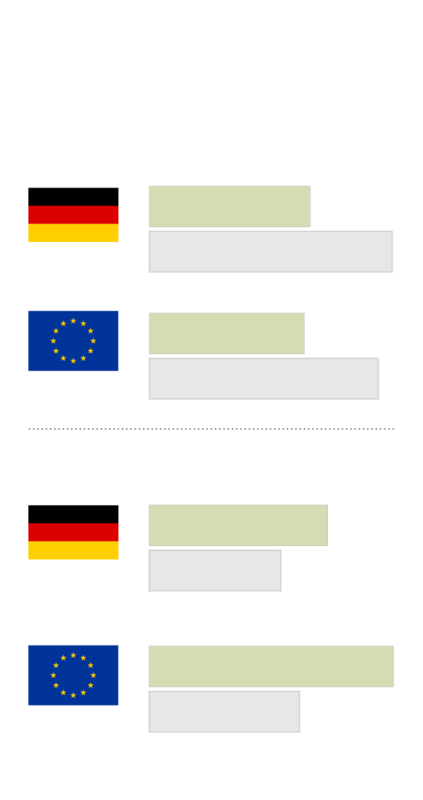 In opinion polls, the German public expresses ambivalent attitudes toward refugees. On the one hand, a majority of German adults (61%) think refugees increase the likelihood of terrorism. But most do not see this as an acute threat: About seven-in-ten say the arrival of large numbers of refugees from countries like Iraq and Syria represents either a “minor threat” (49%) or no threat at all (22%). 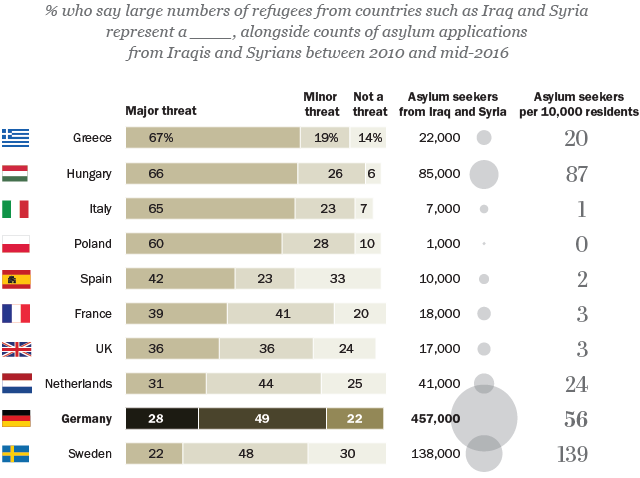 Only about three-in-ten (28%) say these refugees are a “major threat” to Germany. People in several other European countries – including Greece, Hungary and Poland – are more inclined to see refugees from Iraq and Syria as a major threat. For more on Europe’s growing Muslim population, see this full report.